Roberta Jeanne Brady, affectionately known as “Bobbi” to her family and friends, passed away unexpectedly, but peacefully, Sunday, August 12, 2007, at her home in Fort Lewis, Washington. She was 58. She was preceded in death by her mother, Maria Sweeney Brady in 1964. Bobbi is survived by her loving husband of 18 years, SGM John D. Terrell II, USA, of Fort Lewis, Washington; her son, Mark C. Smith and his wife Janet and 1 year old grandson, Joshua, of Santa Clarita, California; her father, Lt. Col. Leo F. Brady (ret.) and his wife, Florence, of Foley, Alabama; her sister, Patricia Brady Wamsted and her husband, Ron, and their children, Katelyn Hendrickson and her husband, Justin, and Alan Wamsted, of Austin, Texas; her aunts Joan Sweeney Corbett and family, and Carole Sweeney of California; her uncle Joseph Sweeney and family, of Florida; numerous cousins; and Chardonnay, her beloved dog and companion for the past 15 years. Bobbi was born December 2, 1948 in Fort Totten, Long Island, New York, to Leo F. Brady and Maria Agnes Sweeney. She spent her early years in Bayonne, New Jersey, while her father was stationed in Korea. Her father was a career officer in the USAF, and as such, Bobbi moved often. She lived in several southern states, Alaska, Germany and Turkey. The family traveled extensively throughout Europe. She graduated from George C. Marshall Regional High School in Ankara, Turkey in 1966. She made many life long friends and kept up with them over the years. Bobbi worked as a flight attendant for Pan American Airlines before getting into office management and bookkeeping in the Washington, D.C., area. She studied accounting at Northern Virginia Community College and was a financial consultant for a time. She earned her Realtor’s license in Florida in 1990. 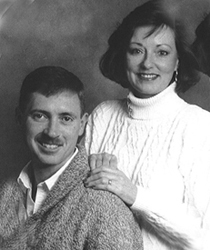 Bobbi married John (JT) in 1989 and started life as a military spouse. At each Army Post Bobbi got involved with volunteer work and made many close friends. Keeping busy with family, friends and volunteering was important to Bobbi, especially during JT’s assignments to Korea in 1991, Iraq in 2003 and again to Korea this past year. He had only been home a short while, and they were preparing to move to Fort Irwin, California, when she passed away. During JT’s first assignment to Fort Irwin, California, from 1997 to 2000, Bobbi performed many volunteer services and held leadership positions to include: Installation Volunteer Coordinator, President of the Enlisted Spouses Club, and Family Readiness Group Coordinator, to name a few. Bobbi was recognized for her efforts in 1999 by being awarded the Army’s highest lifetime award given to a spouse, the “Dr. Mary E. Walker Award” and was recognized as the “Installation Volunteer of the Year” for her contributions to the community. A year later she received the “Commander’s Award for Public Service”. At Fort Lewis, Bobbi continued to receive many accolades for her service to others. She received the “Keeper of the Flame Award”, another lifetime award from the U.S. Army Ordnance Corp.
Bobbi was very proud of her son, Mark Smith, and his many accomplishments. She was delighted with his marriage to Janet and was excited to become a grandmother, even if she did not want to be called “grandma”. She was making a family album for Joshua’s first birthday and looking forward to her move to California where she would be closer to Mark and his family. Recently, Bobbi’s neuropathy of her feet became worse, and it was difficult for her to travel. She kept in contact with her family and friends via phone calls, e-mails and letters. She was a private woman who cared deeply for her family, her aunts and uncles, and reached out to reconnect with them over the past few years. She was a dear mother, wife, daughter, sister, and friend. She was loved and will be missed by many. Funeral services will be held at Arlington National Cemetery, Arlington, VA, 22211, on Tuesday, September 11, 2007. Services will begin at 2:45 pm at the Old Post Chapel, Fort Myer, VA, 22211, and then proceed to the cemetery for burial. Bobbi’s mother is also buried at Arlington. In lieu of flowers, donations may be made to the college fund for her grandson, Joshua William Smith, to “College America”, c/o Mark Smith, 21939 W. Mikhail St., Santa Clarita, CA 91390. Phone: 661-296-5134; or in her name to a charity of your choice. Obituary online at ankarahighschoolconnections.net/memoriam.htm and statesman.com/obituaries. Arrangements by Funeral Choices, 800-378-4481. Published in the Austin American-Statesman on 8/25/2007.